Welcome to the annual Star Wars Blog Hop Party! Our blog hop is sponsored by Jaded Blossom and SVG Cutting Files! If you are an avid Star Wars fan, you will be thrilled with the Galactic projects the team has created! Now if you came here from Barb, then you are in the right place! If not - you DON'T want to miss a single project, so start at the beginning with Candace. 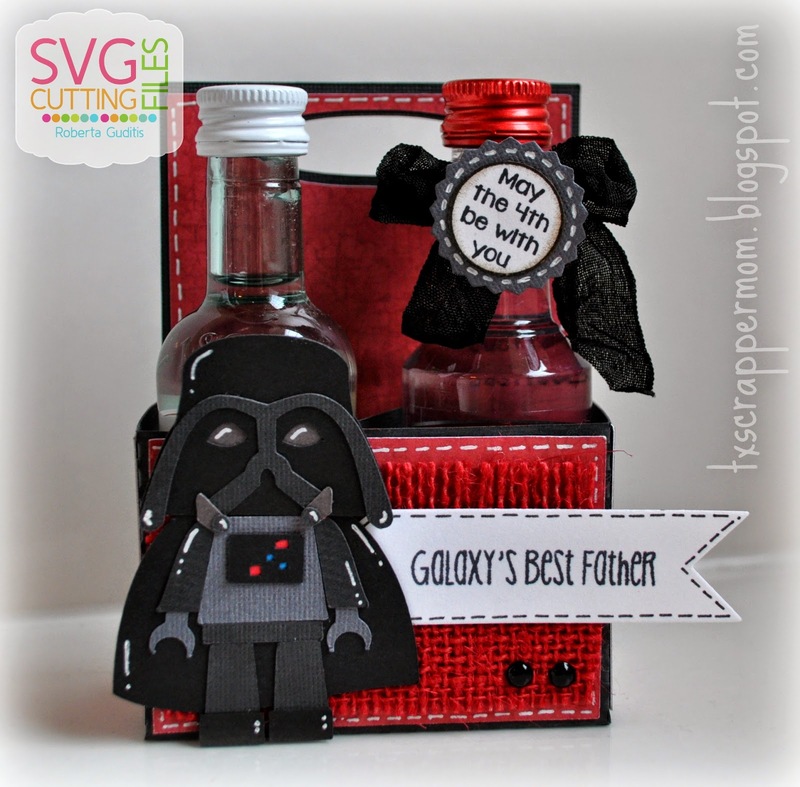 I absolutely LOVE this Lego Vader and wanted to make a gift using the Mini Bottle Carrier from SVG Cutting Files. The sentiments from Jaded Blossom's Candy Wars are absolutely perfect for this project! I also used the Jaded Blossom Flag Die and Candy Charms Die. I finished it off with some ribbon from Lovebug Creations and voilà! A gift for dad! How to earn these Amazing files for FREE, for TODAY ONLY? 1- FOLLOW each blog stop along the way (there are 13 stops in this hop)--- THERE ARE SOME NEW BLOGS Added in our rotation, so make sure you are Following them as well!! 3- During one of your stops along the way, it will tell you where to go to REQUEST the files. You MUST follow the guidelines correctly in order to qualify for the files, NO exceptions. THANK YOU! great projects - both are perfect for fathers day! In Star Wars heaven with all these wonderful creations! How fun. Thank you for sharing. these two files are just brilliant ....... love em!!! This Hop is amazing. Ladies you have done a amazing job. Thank you all the way to a galaxy far far away. Seeing all this candy is making me hungry. Great projects! Thanks for sharing!! An Ewok woohoo. Was always my favourite from childhood and you have done a wonderful job. Can't wait to give these a go!! Oh oh i loooove darth Vader. i know what i will be making for fathers day, Thanks for sharing, both creations are wonderful! Wow! Love your projects and the files are just gorgeous. Love lego Vander! my 6 year old is sooooooo excited! Wow! I really love this two. Beautiful work. Awesome job! Thank you for sharing. These are so cute! Love this Vader and the Ewok is adorable. I love these especially Dark Vader! So cute - great projects. These are both great! Thanks for sharing. My heart is melting with these adorable projects! Thank you for sharing! I love both these projects thanks for the inspiration. Love Lego Vader! So cute! love, love, love.....lego vader and ewok are too cute. OMG I love these! so cute! Love the ewok, and darth too. My DD is a huge Star Wars Fan and is going to love these. Such cute projects... dont know where to start.. LOVE that bottle holder with Darth..but that Ewok is too flipping cute!! ROBERTA!!! This is SUPER awesome!!! I LOVE both of these projects!!! But I must say the Ewok is my fav! They are just TOOOO cute!!! Great job girl!!! love that darth vader! you did a great job! Lego Darth Vader and an Ewok, these are too stinking cute!! Wonderful projects! I really like the Darth Vader idea for Father's Day! This is awesome!!!! Love Darth Vader!!!! OMG. Love these. Thanks for sharing. OMG!!!!! LOVE LOVE LOVE these!! These are my favorite projects so far. Fantastic job. Thanks so much. I think these two will get the most use! Thank you! I love both of them! Thanks! Never thought of doing a mini bottle holder! Fabulous projects, Roberta. The Ewok is precious but who does love Darth Vader. I'm going to be making these next weekend!! These are darling!!! Great job!! way adorable! Thanks for sharing! I love ewoks, that one is so cute. The lego vader is perfect for all the legoland trips my family makes. perfect for all my star war geeky friends and young ones. can't wait to make cards for them. Great use of the Star War files. Can't wait to use them to send my friends that are Star War fan fanatics. These are just the best ever, great great job. Both projects are so cute! So cute--love the mini bottle holder-- so stinkin' cute!!!! Just went to see the Lego movie with Son and grand daughter, She will love making Darth Vader for him for Fathers Day. Thank you for sharing! That ewok is the cutest flippin thing I've seen yet!!!! Darth Vader is incredible, love them both! My first time seeing the mini bottle holder and I love what you did with it! So cute! Love your projects! Thanks! LOVE your blog!!!! started with the hop (fantastic) and kept on scrolling!! I'm loving both of your adorable projects. 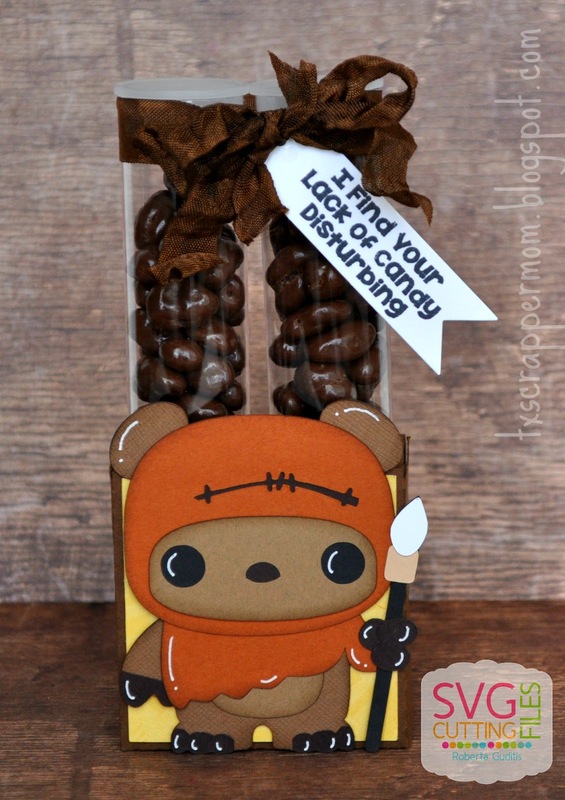 The vader one is so perfect for father's day and who can resist that cute ewok?? Your Lego Vader drink carrier and Ewok treat holder are great! May the 4th be with you! Awesome projects. I love the cut file boxes that you also chose to showcase. Ewok is my youngest daughters favorite!! I love it. Both treat sets are AWESOME! My favorite is that cute little Ewok! So cute, I love Lego Vader, and Ewok is just awesome, I also like the minibottle, become your follower since yesterday. I will definitely be following you. Nice projects. So so creative! Love Darth! I love that Ewok!! He is so stinking cute! Thank you for sharing your creations with us. These are both AMAZING Roberta!!! LOVE LOVE LOVE them! Love both of your projects really cute!! I love your Darth Vader! May the fourth be with you! Again, another 3-D project done very well. Anyone would love to get this gift. These are so stinkin cute!!! I LOVE that Ewok!!! Great designs! Your dad is going to LOVE Lego Vader!! EwoK is adorable also!!! Your projects are great! Can't wait to get them! My fav so far. Very cute! These are wonderful, Thank you for sharing with us. Very cute projects! Love them both!! Both are very cute! Thanks! I love your Darth Vader! You are so talented! Love your projects! Thanks for the fun hop! Lego Star Wars. That is awesome. Such a cute take on Star Wars! Luv the project! more candy tube ideas!! I am a happy crafter. I love the ewok! he's adorable! So cute! I cant wait to use that ewok! Wowza! This is so adorable!!! Love him!! !